If you told me a year ago that we would have a comic about a ghost version of Hitler teaching Red Skull the heartwarming meaning of the “Hail Hydra”, I probably would have cringed. However, this crazy premise, and much more, is included in Marvel’s Gwenpool Holiday: Merry Mix-Up, a follow-up of last year’s Christmas-themed laughfest. Framed around the fourth wall-breaking Gwenpool, the one-shot collection is guaranteed to make you chuckle throughout your Christmas and holiday parties this year. Gwenpool is a strange character with even more peculiar origins: her first appearance was on a variant cover in last year’s Secret Wars event as an amalgamation of Gwen Stacy and Deadpool. Fans loved it so much that she became her own character in three Howard the Duck back-up strips, extending to a holiday special and an ongoing series in April. Having no real superpowers other than comic self-awareness, Gwenpool is a designated protagonist that has an iffy morality system and no way to get back to the real world. Within the first few issues of her main ongoing series, she beat M.O.D.O.K. and took over his organization, making a few friends in the process. It’s with this knowledge where we begin the one-shot, with Gwenpool wondering why her teammates don’t celebrate holiday traditions like she does back home. She realizes that all the holidays are magically screwed up, and decides to head to the North Pole in order to investigate what’s going on. What follows are a few stories that reflect these changes, and they all hit some pretty high notes. I Saw Spidey Kissing Galactus: The Bringer of Gifts has Miles Morales trying to fight the monstrous Fin Fang Foom on a busy Christmas night while also tackling his belief in San… Galactus? In this continuity, Santa Claus is replaced by a yellow-suited Galactus, a mythical figure that only children believe is real. Miles still “believes” in Galactus, talking with his friend at the mall about why he does. With Fin Fang Foom’s appearance, Miles narrowly defeats the monster, only for a few other villains to show up at the nick of time; it would take a Galactus-sized miracle to save him now! The message is a little trite, but it’s done well enough that the whole approach seems tongue-in-cheek in a very positive way. It also helps that Ryan North’s signature wittiness (including some great banter on the footnotes of pages) makes the story pop when it needs to. The art style complements the story, since it accurately portrays a fight on a busy shopping night while not making anything too flashy. If you ever wanted to see Frank Castle in hot pants, The War on Pantsgiving is up your alley. A social critique on Black Friday, the story lampoons Thanksgiving by replacing it with Pantsgiving, a holiday where everyone buys their loved ones a set of hot pants to wear for the day. Everyone from Kate Bishop to Deadpool get in on the action, so of course the art emphasizing characters’ beautiful legs is present. The story’s art feels snappy and clean, and it was a neat treat to see everyone in outfits that weren’t the norm for them. Gwenpool’s designer Ronnie is depressed that her hot pants aren’t selling this year, so she decides to summon Fin Fang Foom in order to wreak havoc and force everyone to buy pants from her. A weird premise sure, but even weirder is The Punisher’s involvement in all of this. He ends up trying to teach everyone the meaning of Pantsgiving, which is unusual but heartwarming at the same time, and Chip Zdarksy does a great job of characterizing The Punisher to be a more sympathetic man here, with him delivering the mushy speeches these stories usually entail. It’s a Hallmark-esque tale with a little eye candy mixed in for good measure. Happy Hydra Holidays is probably my favorite story of the bunch, as it’s a self-aware allegory on how political correctness invades our lives in the weirdest ways. As Red Skull (the Hitler idolizer and Captain America baddie for those who don’t know) is lectured at a Starbucks-like coffee shop on the importance of using “Hail hatred” in lieu of his trademark “Hail Hydra” to be inclusive of all villains, he starts to have an existential crisis about what it means to be a villain. This story expertly comments on why people are so adamant about using consistent terminology, and does the nigh impossible job of making a supervillain likeable. It doesn’t hurt that Clint Barton’s cameo is one of the most hilarious moments of the one-shot, with his character spewing out some very charming nuggets of wisdom. However, my favorite part of this strip was the appearance of a ghost version of Hitler as he tries to convince Red Skull of being more lenient ala A Christmas Carol. It’s a story that should be terrible and unfunny, but ends up being glorious due to the delivery and self-awareness. While not in the main line-up, Deadpool ends up shoehorning a Halloween story into the collection, citing that since the book is a “Holiday” special, he can do whatever he wants with it. Deadpooloween has the titular merc with a mouth crashing a college party where everyone’s dressed like him for a costume contest. Enter Squirrel Girl, who’s organizing the shindig as well as an obscure villain that was introduced in Great Lakes Avengers. After Tippy Toe, Squirrel Girl’s animal sidekick, is captured, it’s up to Deadpool to save the day while trying to convince the judges to vote for him. The story hits the right notes, but I truly liked how Squirrel Girl is portrayed here. Cracking a “deez nuts” reference and being slightly less family-friendly than her main series counterpart, it’s really a testament to how versatile Doreen Green can be when handled by another writer. With all of these gut-busting stories, it’s a shame that the main Gwenpool story, and the character herself, are lacking in comparison. While it is necessary to help set up the stories in the beginning of the one-shot, it ends up being disappointing as a whole since it’s unforgettable and slightly cliché. While the messages in the other strips are ham-fisted and slightly preachy, they’re done in a cheesy and oddly charming way. The framing story just feels like it’s there for the sake of existing, and it really doesn’t build up any exciting tension or laughs in the climax. Gwenpool has to play the straight man that reacts to the bizarre comedy of the prologue, which is a role that really doesn’t suit her. 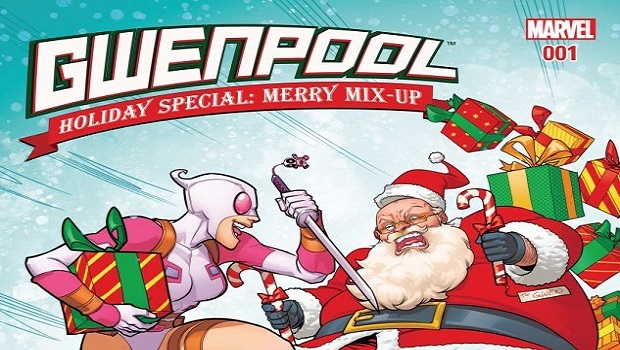 While the stories don’t highlight the titular character as much, Gwenpool Holiday: Merry Mix-Up encapsulates everything we love about the holidays and wraps it up in a nice, comedy-laden bow. This is one comic you don’t want to miss this month. Elisha Deogracias is an aspiring accountant by day, freelance writer by night. Before writing for Gaming Trend, he had a small gig on the now defunct Examiner. When not being a third wheel with his best friends on dates or yearning for some closure on Pushing Daisies, he's busy catching up on shonen manga and wacky rhythm games. Mains R.O.B. in Smash. Still doesn't know if he's a kid or a squid.